I used Sally Hansen Trendy Creme as a base, with American Apparel Cotton for the white background of the medical cross. For the cross, I used A Beautiful Life Poison, and for the numbers, I used American Apparel Manila. Topped everything off with a coat of Essie Matte About You to give it that old worn drab look. Grape Nehis are actually pretty great, and not that hard to make, so if you still want to try one all you need is 2 oz vodka, 2 oz raspberry liqueur, 3 to 4 slices lemons and 3 to 4 ice cubes. Crush up the ice and the lemons (or oranges) and pour in the vodka and liqueur. Pour the whole thing (through a strainer) into your cocktail glass and garnish with a lemon or orange wedge or some salt and you're all set! 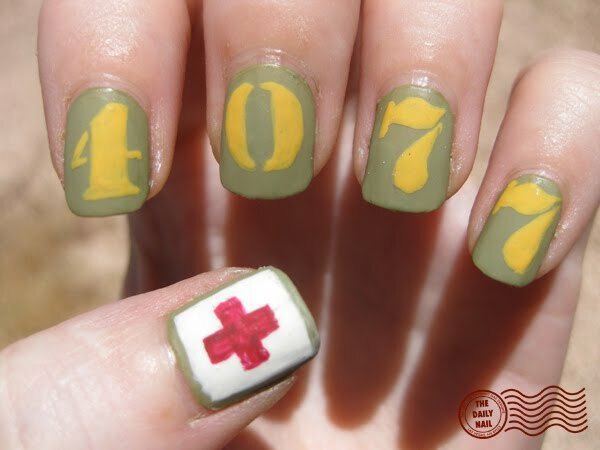 Aw, I love Mash and this manicure is so cute! Makes me want to go watch some. love it! and, by the way, i am now addicted to Matte About You. I've seen every one of your nail posts and you are SO creative! I know people ask you to do nail themes all the time, but since the 4th of July is coming up and on your last military theme post, you missed the COAST GUARD theme...could you perhaps to a Coast Guard theme? My daughter is in it and I would LOVE to send her your link with CG nails! Thanks-you so much for your inspiration and commitment! I love these nails! M*A*S*H was a good show. Radar was always my favorite. I'd marry him in a heartbeat. Now that you've done M*A*S*H nails, you need to do the Golden Girls. I imagine you like them, haha. You're all this coolness so you'd have to, right? that is incredible! very inventive! galadrijella i also agree with you ..
Where on earth do you get all your inspiration from? LOL! You're incredible! I love MASH! I watch it everyday!! Great idea!! Radar did not drink Vodka, he drank Nehi Grape Soda!! Ms. Daily Nail- Awesome nails, as usual, and I agree about M*A*S*H! What I loved about it was that it was intelligently written, and had the ability to walk the line between hilarious and bittersweet. That's really special. And for Jon and Faybee: Anonymous is right-before a "Grape Nehi" was an alcoholic beverage, it was a soda pop. (that's me appealing to both the 'soda' and 'pop' factions) That is why they came up with the recipe for the alcoholic drink- they were trying to make it taste like the soda pop. There was also an Orange Nehi, which was similar to Orange Crush, and I'll swear there was Strawberry, too, but I might be hallucinating. The soda pop version is what Radar drank, so it WAS virgin- Faybee's right! That's what made it so poignant when he actually did take a shot of liquor. Here's a website that sells Nehi- they have a peach flavor now! I love this show! I never expected to see it on someone's nails! Remember to Eat Your 5 a Day! Smashbox Cosmetics Sale at Hautelook!